The Shape node takes as input the lock image. In the shapes node a Bezier spline is drawn around the lock. The Bezier spline is rendered using the lock image as fill, and a red stroke. Drag the Paint icon into the Node Graph. Connect an input image if you need a image fill. Connect an input image if you need a mask fill. Draw the shapes in the image viewport. Images that can be used to use as fill for the shapes. The drawn shapes, with fill and stroke applied. 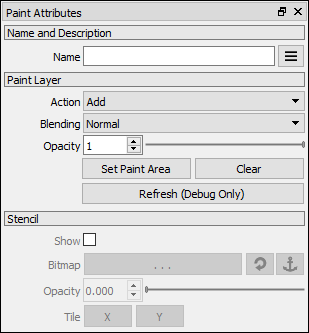 The paint node have this options. The shapes node adds a toolbar to the top toolbar panel when active. This top toolbar is updated when the left toolbar tool changes, or when a new current node is activated. Allows the user to create a new Bezier spline. The new Bezier spline will be added to the current shape. Allows the user to click a Bezier segment to insert a new control point at that specific location. ;Delete: Allows the user to delete the selected control points. If all the control points of the spline are selected, the spline shape is deleted. Allows the user to break the selected control points. If the spline is closed, by breaking a control point it becomes an open spline. Breaking control points can create multiple Bezier splines. Allows the user to weld control points to connect open segments and splines. Allows the user to connect the open ends of one or two Bezier splines that belong to the same shape. Connecting the two open ends of a single spline effectively closes the spline. Reverses the selected splines. All the knots of the spline have to be selected for the reverse to take action. Double-click the spline to select all knots. Allows the user to pick an existing shape. The shape will be converted to a Bezier spline and added to the current shape. The selected shape will be deleted from the shapes list.